Recently, I did something I’ve never done before. One of my instrument students and I did a PAR (Precision Approach Radar) approach. If you’re a pilot and never heard of that, don’t despair. It appears PAR approaches are very rare these days, and (to the best of my knowledge) now only available at military bases with the right personnel and equipment. There’s no approach plate, so you wouldn’t have seen it when browsing approaches. As its name implies, it is a precision instrument approach. When properly executed it is able provide minimums comparable to an ILS. In our example, the student flew to within 250′ AGL in simulated instrument conditions, ending up well aligned with the runway and nearly on glidepath, despite this being the first time either of us had tried it. These types of PAR approaches use special ground based radar and a dedicated controller using a specialized display in order to provide ILS-like lateral and glidepath guidance to the pilot. The strange thing is that all this information is provided verbally over the radio. The airplane flying the approach has no equipment requirement, other than a radio. The hardest part to pin down was the logistics of requesting the approach. Going into this, our information implied we needed prior permission by the local approach control (SoCal TRACON for us) to do the approach. Several calls to SoCal and being sent to various military numbers made it clear that our request was unusual and that no one thought prior permission was required. There were several military bases where it might be possible to do a PAR: March ARB (KRIV), Los Alamitos AAF (KSLI), and Pt. Mugu NAS (KNTD). One piece of information we did receive during the calls was that the necessary controller would be at KSLI after 1400 local. So, we made the decision to launch and see what we could figure out in the air – the worst they could say was “unable” and we’d just do something else. Anyway, Los Alamitos is pretty close to our home base of El Monte (KEMT). From flying around the LA Basin doing a lot of practice instrument approaches, I thought SoCal on 121.3 would be our best chance for finding someone who knew what we were talking about. I’ve heard that frequency coordinating RNAV approaches to KSLI. Looking at the KSLI RNAV approach plate, we made a guess at where we’d need to be. Departing El Monte, we flew the departure procedure up to 3000′ MSL to remain below the LAX Bravo. Instead of calling the normal 125.5, we called 121.3, reporting 10nm north of Fullerton (KFUL) and requested a practice PAR approach to Los Alamitos. The controller indicated we were well outside her airspace, but gave us a squawk code and instructed us to turn towards the south, remain clear of Bravo, and expect radar identification in a few miles. Without any more specific direction, we aimed toward FEBUG, an intermediate fix on the RNAV 22L approach, deciding that would be about where we’d expect to line up for descent. In preparation, we also listened to the ATIS. SLI uses a different kind of D-ATIS than what I’ve heard before. I found it easier to understand, though the speech was much faster. The ATIS referred to PAR approach. Eventually, we were vectored, told to descend to 2600 and handed off to Los Alamitos GCA controller on 124.75 (referred to as RDR on Airnav), which was a good sign for getting the approach we hoped for. 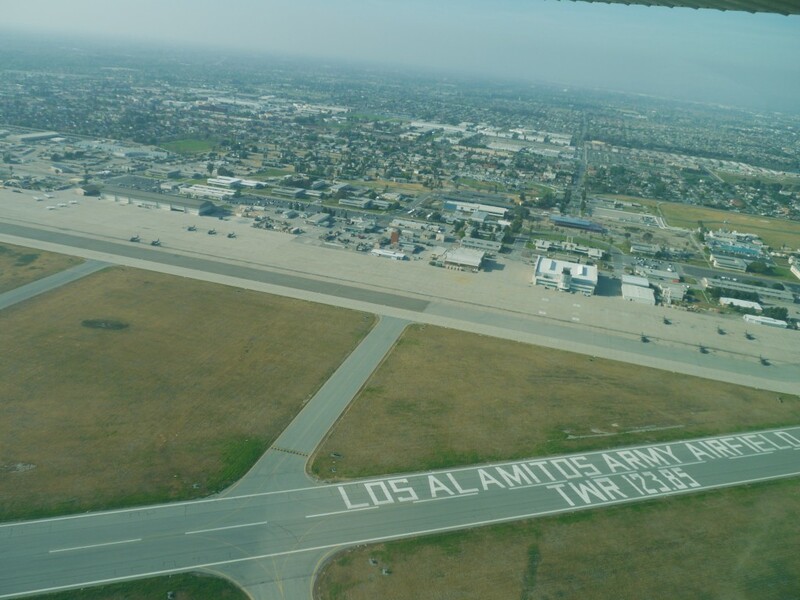 The first Los Alamitos controller had us descend 2000 and gave us vectors for the Los Alamitos PAR approach. This controller also instructed us to “perform landing check”. This is basically a reminder to check that you are in approach/landing configuration. We reported “wheels down”. This controller then handed us to the Los Alamitos Final Controller on 127.95 (also noted as RDR on Airnav) – we were now ready to actually fly the approach. At the airports near here, we can do practice instrument approaches to military airports, but CAN’T land (there are joint use airports in other areas where you might be able to land). Don’t forget. I imagine a lapse there would be frowned upon. I had hoped to be able to put a recording here of the approach. Unfortunately, the quality of the recording this time was pretty poor, so I’ll revert to commenting and transcribing as best I can. Soon after checking in with final controller, we were told to fly heading 220. This is the approximate final course and allows the controller to correlate assigned headings with what he sees. We were then told to begin descent. We used a power setting and speed that is typical for a standard ILS (about 1700 rpm in our 172). Almost immediately we were told to not acknowledge further transmissions. We were now to the point where updates would be frequent and where the controller would see we acknowledged through our actions. Heading 217. Slighly above glide, coming down slowly – This is like a needle below the line on an ILS, but with a trend getting you closer to the glideslope. No adjustments of power or pitch required. 5 miles from touchdown. Slightly above glide path, coming down slowly. Slightly above glide path, coming down slowly. Continue left turn to 215 – now the controller is giving a slight turn to the left to increase the rate of correction to the desired course. Slightly right of course, correcting slowly. Slightly above glide path, coming down slowly. Slightly right of course, correcting slowly. On glidepath. Slightly right of course, correcting slowly. 3 miles from touchdown. Going slightly below glidepath – time for a slight increase in power or pitch. Slightly right of course, correcting slowly. Reaching lower safety limits. Slightly right of course. Heading 212 – time for a little more power. Holding at lower safety limits. Slightly right of course, correcting slowly. Slightly below glidepath, coming up slowly – more like it on power. Appear to be leveling off for low approach over approach end. At this point we continued visually to the end of the runway per our climbout instructions and were handed off to SoCal for our next approach (which by the way – SoCal vectored and cleared us to the wrong airport, that made for a lot of last minute adjustments). This was a great experience and I’ll definitely be back to try it again. Maybe I’ll get a better audio next time. http://forums.jetcareers.com/threads/mikeds-gca-asr-and-par-approach-review.4099/ was very helpful in knowing what to expect in addition to the guidance given in the AIM. Thanks to Sergei for the idea to do this and to our local DPE, Alan, for giving Sergei the idea and some details on how to request this.